Player 1 starts, player 2 checks away, player 3 receives and sets back to player 2. Player 2 plays into player 4 who sets back to player 3 who plays into player 5. Coach opposite movement off the ball and quick reactions Player 2 always dictates which way the first pass will be played. Coaches take a group each. 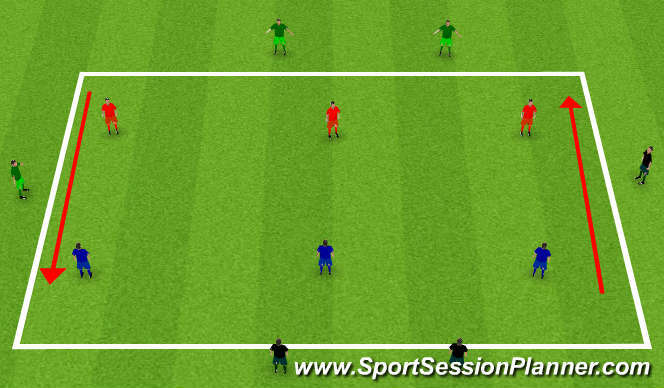 Divide the players into attacking and defensive players. Midfielder 1 passes to 2 who plays to wide man. No. 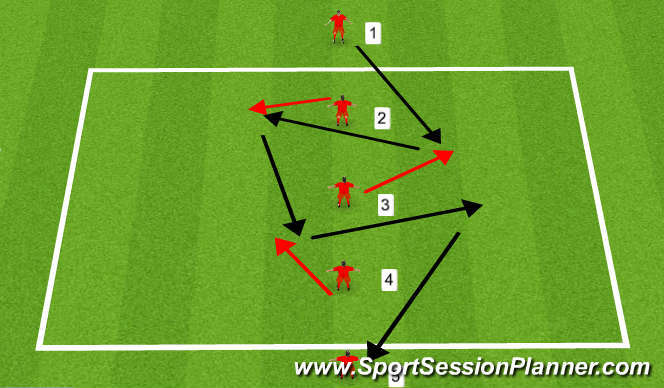 4 receives and switches it to the other wide player (no 5) who plays into the no 6 to turn and shoot. 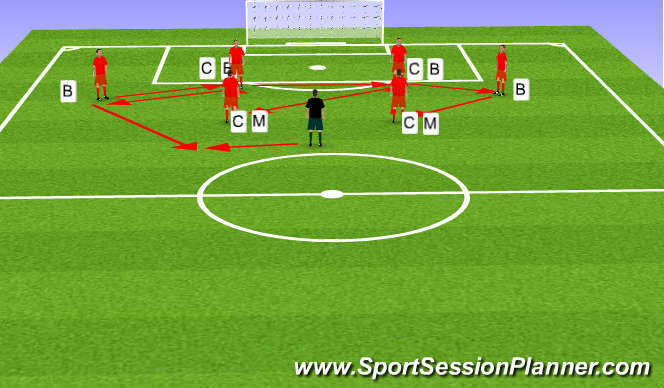 Back four combine neat and quick patterns of play with the two CMs. If coach shouts long. CB clips the ball into his hands, if turn then CM gets on the half turn and plays into coach, if Feet-the Full -backs play into his feet. Progress into whole team passing combinations. 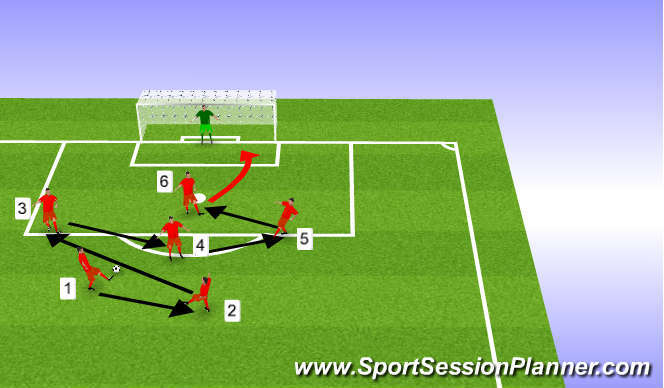 3 v3 in the middle have to try and penetrate the ball passed the three opponents into the two men on the end. Must play 2 passes before the final ball. Can only use players behind them or along the sides for support. Players on the outside 2 touch only. Players on the inside three touches max. Encourage creating space as a team and quick decision making. Movement off the ball. 3 min matches and change teams over. 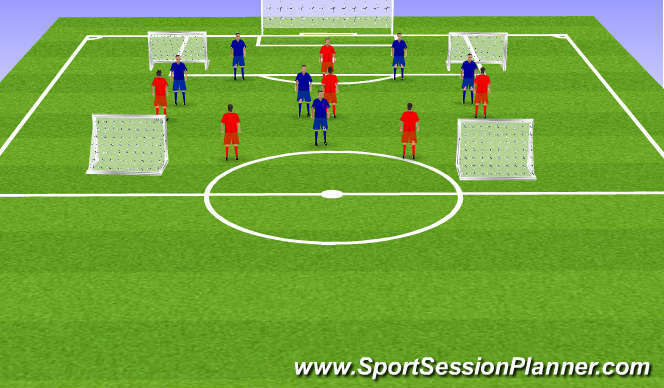 Two teams set up in the 2-3-1 formation and focus on positional awareness, movement off the ball, creating space, switching the play if necessary.